With new initial coin offerings (ICOs) now being announced on an almost daily basis, it’s been challenging for investors to decide where to invest, or what exactly they’re getting for their money. Valuations have largely been determined to date by trust in founders, the white papers they write and the strength of target use cases. But with more than $2 billion having already flowed into token sales, blockchain startup Balanc3 thinks it’s time to make ICO accounting more sophisticated. Last week, in the first live demo of its new accounting platform, the company gave more than 200 people from the “Big Four” accounting firms, other blockchain startups and regulatory agencies a glimpse into a new way to value ethereum-based token sales. While this would be good for investors, it’s not as easy as just switching this functionality on to provide such insight. ICO issuers will have to sign up with Balanc3 and turn over all addresses associated with the offering. Balanc3 then aggregates that data into a single account where project bookkeepers can provide line-by-line categorization (such as payroll, inventory, sales, business travel etc) of all transactions entering and leaving those accounts. While it might seem hard to imagine a company that has conducted an ICO opening up its books to investors, Balanc3 believes investors might start demanding that transparency to gain the security of knowing where their money is being used. Currently working on the beta version – with hopes of it going live in early November – Balanc3 is trying to figure out how best to feed the information ICOs put into the system to investors. 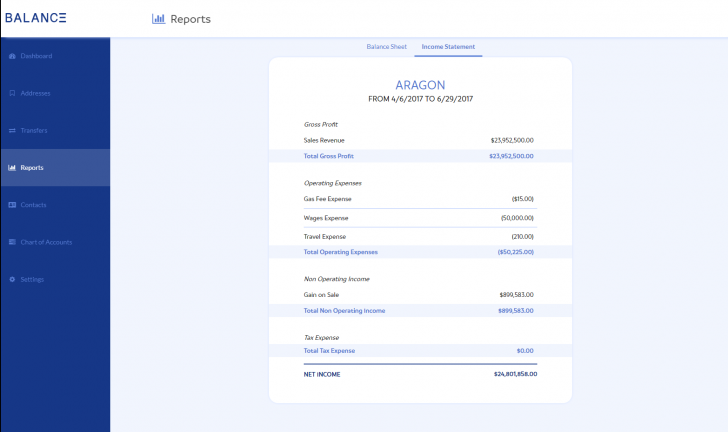 In the demo, live financial statements were revealed for token sales from early adopters Aragon (valued at $56 million), Digix (valued at $140 million) and Gnosis (valued at $142 million). Included in the data were expenses such as wages and travel, and a breakdown of other crypto-assets owned by the companies. Aside from possible bumps to their market cap, ICO holders might also adopt the platform for its features, which Anderson touted as saving both time and costs. For instance, the categories and other metadata tacked onto transactions can aid the automated reconciliation of accounts, which should make transactions more easily identifiable and, in turn, cheaper to track. While accountants using the alpha release are still expected to manually add the appropriate descriptions, Anderson said that eventually that process could be automated. The other possible benefit of the Balanc3 platform is the so-called triple-entry accounting (from where Balanc3 took its name). Transactions are not only logged to show the money received in one account and deducted in another, but are also recorded on a cryptographically protected ledger. Originally conceived in 2005 paper by Ian Grigg, triple-entry accounting gained more momentum with the advent of blockchain technology, which creates a cryptographically secure public account. The hype and subsequent growth of the ICO market has not only caught the attention of startups and investors, though. It’s also piqued the interest of regulators. After years of waiting to provide formal guidance, the U.S. Securities and Exchange Commission (SEC) recently issued a trove of documents and most recently created an entire unit dedicated to policing token-based investment vehicles. Other jurisdictions around the world are also starting to weigh in, some extending an accommodating hand and others taking a harsh stance. Anderson believes the Balanc3 platform, among other things, shows the industry is interested in proactively taking steps to hold companies accountable and keep investors safe, which could influence how future regulatory hammers come down.